3M Keyboard Drawers incorporate innovative ergonomic designs with space-saving features that help maximize workplace comfort and productivity. These keyboard drawers are sturdy, comfortable, and they are incredibly easy to adjust. Each keyboard drawer features a cushiony-soft 3M Gel Wrist Rest and a 3M Precise Optical Mousing Surface. 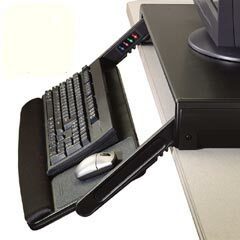 3M Adjustable Keyboard Trays use a Track Adjustable Platform to adjust both the height and tilt of the keyboard and to move the keyboard forward or backward at both corner and straight-on workstations. Several models of the 3M Adjustable Keyboard tray also feature an adjustable mouse platform that can be mounted on the left or right side and easily adjusts up, down, forward and back. 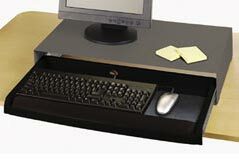 Adjustable Underdesk Keyboard Drawer slides on steel ball bearings and offers three height positions. Slide-out mouse tray with Precise mousing surface for right or left hand use. Soft gel wrist rest plus cable management system. Fits most keyboards. Endorsed by the American Physical Therapy Association. Black. Wide platform places mouse next to keyboard (right or left). Includes Precise optical mousing surface and full-width gel wrist rest. Steel reinforced construction. Built-in cable management. Fits most keyboards and supports up to 80 lbs. or 21" monitor. Endorsed by the American Physical Therapy Association. 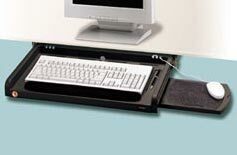 Easy to install underdesk Articulating Keyboard Platform is height and tilt adjustable. Wide platform places mouse next to keyboard (right or left) for less reach and added comfort. Precise optical mousing surface, full-width gel wrist rest and built-in cable management. Fits most keyboards. Endorsed by the American Physical Therapy Association. Wide platform places mouse next to keyboard (right or left). Includes Precise optical mousing surface and full-width gel wrist rest. Steel reinforced construction. Built-in cable management. Dual-arm platform allows for height and tilt adjustment below desk level. Fits most keyboards and supports up to 80 lbs. or 21" monitor. Endorsed by the American Physical Therapy Association.